One injured as Civil Administration officers attempting to shut down illegal Arab quarries attacked by dozens of rioters hurling stones. 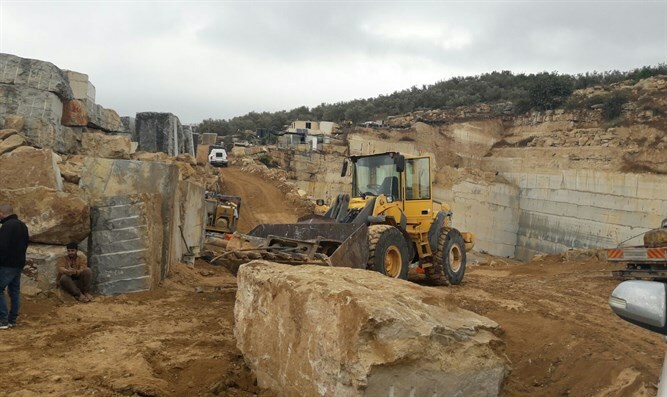 A unit of Civil Administration officers arrived at two illegal Arab quarries near Asira al-Qibliya in Samaria Monday to enforce orders against unauthorized operations at the two sites. During the enforcement operation, however, dozens of local Arabs attacked the Civil Administration officers, hurling rocks at the team. Officials say some 40 stone-throwers attacked the officers, injuring one and damaging a Civil Administration vehicle. Officers confiscated two loaders and disabled a bulldozer found at the illegal quarries. A Civil Administration spokesperson noted that the agency had conducted operations against illegal quarries in the area just several months ago.